Helford Geoscience can provide high resolution data sets from samples of cuttings, core or outcrop. Traditional reservoir sedimentological studies including petrography, heavy mineral analysis and diagenesis can also be applied to the detailed mineralogical characterisation of mudrocks. In particular we have been developing the application of automated mineralogy using QEMSCAN technology to characterise and visualise the distribution of detrital and diagenetic phases and porosity in cuttings, core and outcrop samples. These complex data sets are crucial in the understanding of reservoir quality. In addition we can utlilise a wide range of analytical tools to unlock the mineralogical understanding of reservoirs and source rocks including optical microscopy, scanning electron microscopy, X-ray diffraction, cathodo-luminescence and electron microprobe analysis. 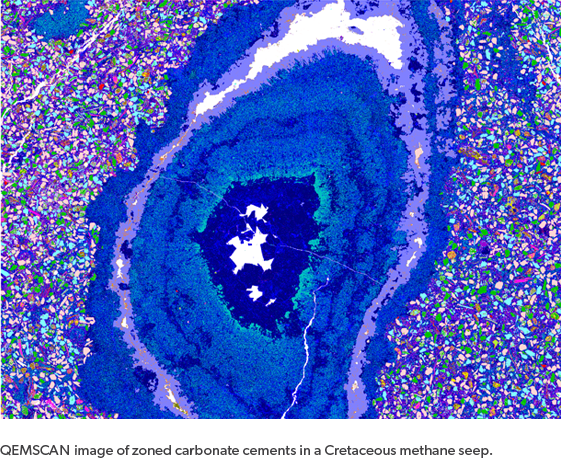 Automated mineralogy using QEMSCAN technology provides a new way to measure and visualise sedimentary rocks. 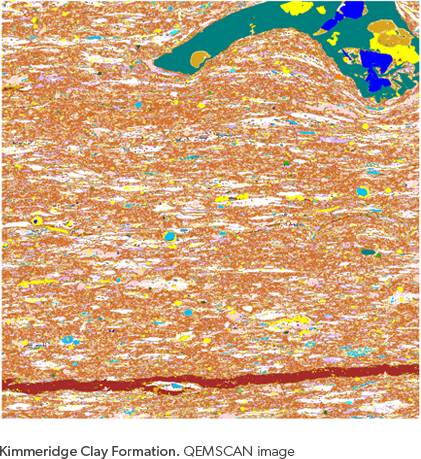 Analysis provides modal mineralogy and porosity data in textural context, allowing the visualisation of the spatial distribution of phases of interest. Helford Geoscience have utilised QEMSCAN technology in the analysis of conventional polished sections from core and outcrop along with the analysis of cuttings prepared as grain mounts. analysis to meet your project needs. Unlock the mineralogical, textural and lithological information hidden within your cuttings. Careful sample preparation and analysis allows detailed data sets on mineralogy, texture, lithology and porosity to be determined from samples of cuttings. We use automated SEM-EDS analysis to understand the petrography of cuttings of any lithology, allowing the determination of lithology and lithotypes, provenance and diagenesis. Data can be output either for the overall cuttings sample or on an individual cutting by cutting basis. A bulk cutting sample can also be analysed to determine the range of different lithologies (lithotypes) and their relative abundance to be determined.